Τα προβιοτικά (φιλικά βακτήρια) είναι ευεργετικά για την καλή λειτουργία του πεπτικού συστήματος και η κατανάλωση τους κρίνεται απαραίτητη κατά τη περίοδο λήψης αντιβιοτικών και γενικότερα σε πεπτικές διαταραχές. Τα προβιοτικά που χρησιμοποιούνται συνήθως σε τρόφιμα και συμπληρώματα διατροφής έχουν περιορισμένη διάρκεια ζωής, κυρίως λόγω υγρασίας και θερμοκρασίας, παράγοντες που περιορίζουν τη συντήρηση του προϊόντος: η καμπύλη επιβίωσης μειώνεται γρήγορα, γεγονός που υποδηλώνει ότι ο αριθμός των ζωντανών προβιοτικών βακτηριδίων μειώνεται ραγδαία με το πέρασμα του χρόνου. Μια άλλη αδυναμία αυτών των μικροοργανισμών είναι η υψηλή ευαισθησία στις γαστρεντερικές καταστάσεις που μειώνουν σημαντικά το αρχικό μικροβιακό φορτίο. Η πρόοδος της έρευνας στον τομέα της επιστήμης, της κυτταρικής και της μοριακής βιολογίας κατέστησε δυνατή την ταυτοποίηση και επιλογή συγκεκριμένων στελεχών προβιοτικών βακτηρίων ικανών να αντέξουν τις δυσμενείς συνθήκες και να επιβιώσουν στο έντερο όπου, χάρη στην ικανότητά τους να προσκολλώνται στο επιθήλιο, είναι σε θέση να εγκατασταθούν και να αναπαραχθούν. 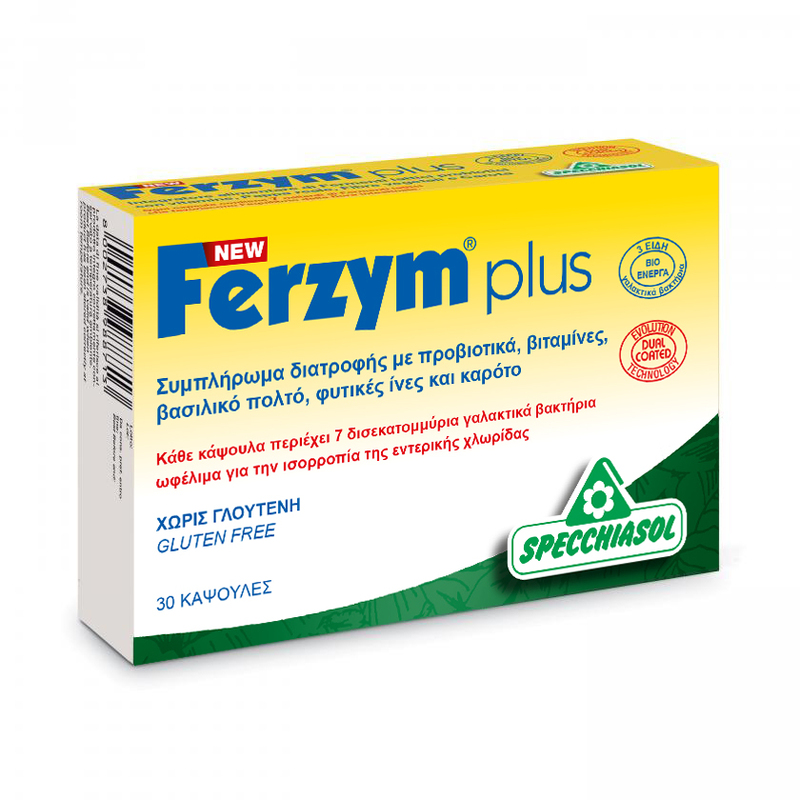 Το Ferzym Plus περιέχει προβιοτικά με τεχνολογία DUAL COATED® που τα καθιστά ιδιαίτερα βιοδιαθέσιμα, σταθερά και ανθεκτικά σε δυσμενείς συνθήκες. Το Ferzym Plus της Specchiasol είναι μία ολοκληρωμένη προβιοτική φόρμουλα με 7 δις προβιοτικά, βιταμίνες του συμπλέγματος Β, βασιλικό πολτό, φυτικές ίνες φρουκτοολιγοσακχαρίτες (FOS) και καρότο. B VITAMINS: for a burst of energy Vitamin B1 (thiamine): regulates the energy use of glucose; a de ciency may cause neurological dysfunc- tions and gastric disorders. Vitamin B1 requirements increase in cases of severe diarrhoea (e.g. traveller's diarrhoea), fever, stress and alcoholism. VITAMIN B2 co-enzyme of several enzymes that govern the metabolism of fats, carbohydrates and proteins to produce energy (ATP). A de ciency can cause in ammation of the mucous membranes of the mouth, lips, lesions at the corners of the mouth, redness of the tongue, stomatitis. Vitamin B3 (PP or niacin): its de ciency causes aking of the skin and gastrointestinal disorders (gastritis, diarrhoea). Vitamin B5 (pantothenic acid): precursor to Co-enzyme-A, essential for cellular life both in micro-organisms as well as in all vegetable and animal tissues. Its de ciency causes duodenitis, alopecia and anomalies in the synthesis of antibodies. Vitamin B6 (pyridoxine): clinical studies have con rmed the anti-nausea and anti-vomit effect of vitamin B6 which accordingly represents a speci c supplementation in the presence of traveller's diarrhoea. Vitamin B9 (folic acid): essential for the production of red blood cells, for the metabolism of proteins, for the synthesis of nucleic acids (DNA and RNA) and for cell division. Its de ciency causes digestive disorders such as nausea, diarrhoea and asthenia. Vitamin B12 (cobalamin): plays a fundamental role as an enzyme in the nervous system. Its de ciency mani- fests itself mainly in the form of neurological disorders. It lowers the concentrations of indicative markers of allergic reactions in the blood (immunoglobulins, histamine, IL-2, IL-4 ...), providing bene ts to individuals suffering from allergies. CARROT: Natural Source of Antioxidants, Vitamins and Minerals Particularly rich in carotenoids (in particular Beta-carotene), carrot root also provides other vitamins (B, C, PP, D, E), minerals (sodium, potassium, iron, calcium, phosphorus, magnesium) and simple sugars. ROYAL JELLY: the Natural Replenisher A precious product from the hive, royal jelly is appreciated for its nutritional properties. It contains mainly B vitamins (B1, B2, B3, B5, B6, Inositol, Folic Acid, Biotin). It is also a source of carbohydrates (mainly glucose and fructose), minerals (in particular phosphates and silicates of potassium, iron, calcium, and copper and trace elements), fatty acids (the main one being 10-hydroxy-2-decenoico acid), proteins and essential amino acids, choline and acetylcholine, enzymes. Due to these characteristics, it is an excellent vitamin-mineral replenisher, useful for its natural nourishing and invigorating effects. It is used in particular for general debilitation, malnutrition, fatigue in children and the elderly. SHORT CHAIN FRUCTOOLIGOSACCHARIDES (FOS): FOS are prebiotic bres of vegetable origin (the main source is sugar beet), capable of strengthening and maintaining intestinal balance. They are fermented entirely in the colon and promote, in particular, the growth of Bi dobacteria. The recommended doses do not cause bloating and ght the proliferation of pathogens. The assimilation of prebiotic bres by probiotic bacteria leads to an increase in bacterial biomass and the production of important me- tabolites: short-chain fatty acids (SCFA) including lactate, acetate, propionate and butyrate. They are capable of affecting the metabolism of lipids and carbohydrates by controlling blood glucose, reducing the concentration of free fatty acids and cholesterol. They are also directly involved in the prevention of in ammatory bowel diseases (colitis, ulcer disease) and the intestinal absorption of magnesium and calcium. Precisely because of their bi dogenic effect, FOS restore the balance of intestinal ora and help normalize intestinal function, promoting the well-being of the intestinal ora.